Ireland’s biggest hotel operator, Dalata Hotel Group, is to upgrade and expand its Maldron Hotels network in a multi-million euro investment which will provide 418 new bedrooms. The upgrade includes the completed extensions of two existing hotels while also opening two new hotels in Dublin and Cork. This follows the opening of the 237-bedroom Maldron Hotel Belfast City on schedule last March. In addition to 418 new hotel rooms across four of its properties, Maldron Hotels has also upgraded many service offerings throughout its network including Grain and Grill Restaurant and own brand Red Bean Roastery. This December will see the opening of the 164-bedroom Maldron Hotel South Mall. The six-storey hotel will feature two restaurants, a bar, a cafe and six conference rooms. As well as the Grain and Grill Restaurant, Maldron South Mall will also feature The Italian Kitchen, a standalone restaurant offering Italian dining. The newly refurbished Maldron Hotel Sandy Road, Galway, officially opened in June following an extensive refurbishment, extending its 104-bed capacity by 63 bedrooms. 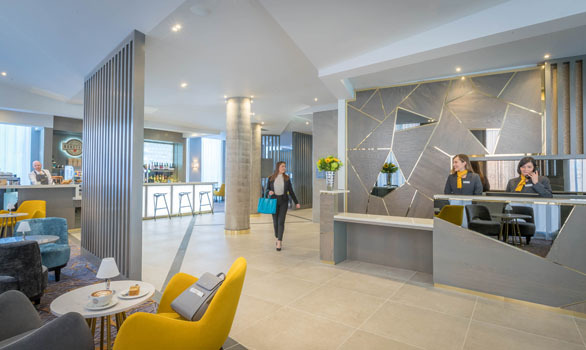 Meanwhile, Dublin’s Maldron Hotel Parnell Square is also due to unveil the results of an extensive refurbishment adding 53 new bedrooms to the property.